For a long time I wanted to make a Saint Honoré cake. I never ate it before, but it always looked tempting, every time I saw it in cookbooks. On my recent trip to Tokyo I finally had my very first Saint Honoré, and from none other than Pierre Herme. It was the rose-raspberry version, which is also known as the Ispahan. After that I was determined to make one myself. I was first thinking about making a raspberry or strawberry Saint Honoré, but I wanted to make something different. So I got this idea while I was picking sour cherries in our garden. 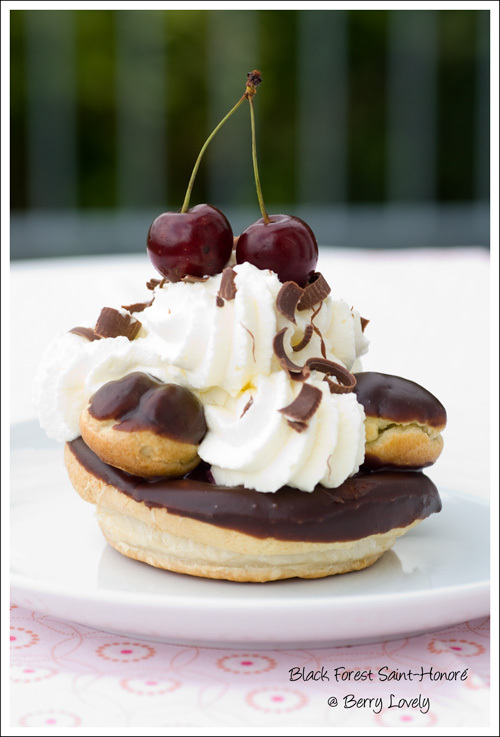 Why not make a Black Forest St. Honoré. It's everybody's favorite, and sour cherries are one of the most important ingredients. Of course, as with any normal black forest cake, you will also need chocolate, Kirsch and whipping cream. This cake is quite a project, what you can see by the length of the recipe. A few components, like the cherry compote, pastry cream and chocolate glaze can be made in advance, and stored in the fridge for up to two days. 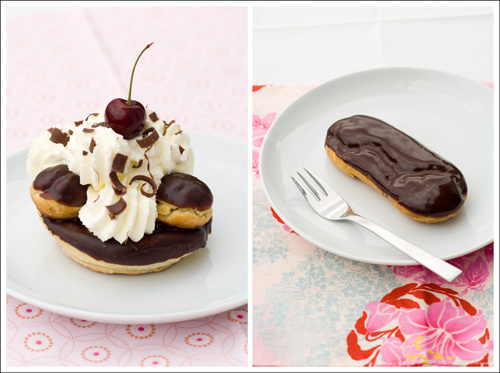 The recipe is enough to also make some extra chocolate eclairs, which share the same base recipes. They were equally good, and maybe a good starting point, if you don't want to tackle the whole recipe. After finishing, I thought I will never make them again, since it's so much work. But taking the first bite, I immediately changed my mind, they were just so tasty. Pit the cherries, making sure to reserve all the juices that come out. If you don't have a cherry pitter you can use a hair needle. Pull the needle a bit apart, then take the pit out with the loop. Place the pits together with the juice and 1/4 cup of water into a saucepan. Cook the cherry pits for a few minutes then strain out the pits and add the cherries to the juice. Cut the vanilla bean lengthwise and scrape out the seeds. Add the sugar and vanilla bean with the seeds to the cherries. Bring the cherries to boil. Mix the corn starch with 1 tablespoon of cold water and stir until dissolved. As soon as the cherry compote comes to boil remove it from the heat and stir in the corn starch mixture. Put back on the stove and cook until thickened while keep stirring. At the end add the Kirsch. Let cool completely. In a small saucepan, bring the milk to boil. In the meantime, whisk together the yolks, sugar and cornstarch. Once the milk has reached a boil, whisk a couple spoonfuls of the hot milk into the yolk mixture. Continue whisking and slowly pour the rest of the milk into the yolk mixture. Pour the mixture back into the saucepan. Place the pan over medium heat and whisk vigorously (without stop) until the mixture returns to a boil. Keep whisking for 1 to 2 more minutes. Stir in the melted chocolate and remove the pan from the heat. Once the cream has cooled down to lukewarm remove from the ice‐water bath and stir in the butter in three or four installments. Return the cream to the ice‐water bath to continue cooling, stirring occasionally, until it has completely cooled. The cream is now ready to use or store in the fridge. In order to avoid a skin forming on the pastry cream, cover with plastic wrap pressed onto the cream. Roll out the puff pastry on a lightly floured surface. Cut out some rounds with the help of a cookie cutter. Put on baking sheet lined with parchment paper and store in the fridge until using. In a saucepan bring the milk, water, butter, sugar, and salt to a boil. When boiling add all the flour at once and start stirring with a wooden spoon. At the same time reduce the heat to medium. Keep stirring for another 2-3 minutes, until you see a slight crust on the bottom of the pan. Transfer the dough in another bowl and let cool slightly. Add the eggs, one at a time, while whisking with a handmixer (you can also use a stand mixer), until completely incorporated. Fill the dough into a large pastry bag with a round tip. Pipe the dough in a circle on top of the puff pastry rounds. Then pipe some small rounds, you need three of them for each Saint Honore. Make some extra to have some backups. 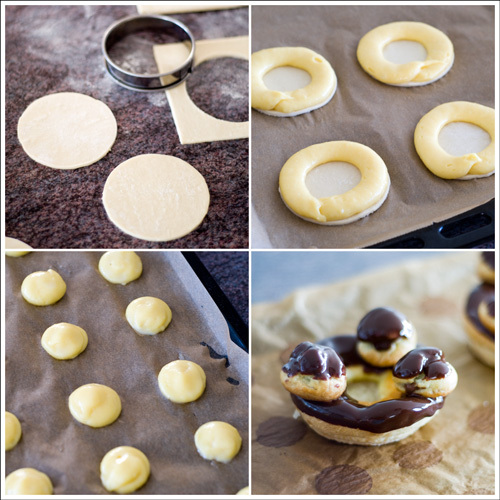 For the remaining dough you can pipe some eclairs shapes. Make sure to leave some space in between as they will puff up. Bake for about 20 minutes, until golden and firm to touch. Be sure to not open the oven for the first 10 minutes. Let cool in the oven with the door opened. In a small saucepan, bring the heavy cream to a boil. Remove from the heat and add the chocolate, stirring with a wooden spoon or spatula. Stirring gently, stir in the butter, followed by the chocolate sauce. It is best to glaze the eclairs after the glaze is made, but you can also make the glaze a couple days ahead of time, store it in the fridge and warm it up over a water bath on low heat when ready to glaze. Using a small pastry tip, poke a small hole in the bottom of each round cream puff. Fill the pastry cream into a pastry bag fitted with a small round tip. Pipe the cream into each cream puff, until you feel they are filled. Dip the top side of each puff base (puff pastry round with choux pastry ring on top) into the warmed glaze, just enough to coat the top. Pull the puff base up and carefully and shake off any excess. Continue dipping with all the small filled cream puffs. Put three of the smaller puffs on each of the puff bases. Let the glaze set in the fridge for a few minutes. Now fill a few tablespoons of the cherry compote into the cavity of each puff base. Whip the cream until stiff peaks form, then add some sugar to taste. Fill the whipped cream in a pastry bag fitted with a large star tip and pipe it on top of the cherries and in between the small puffs in a nice swirl. Top with some grated chocolate and a cherry. Serve immediately. 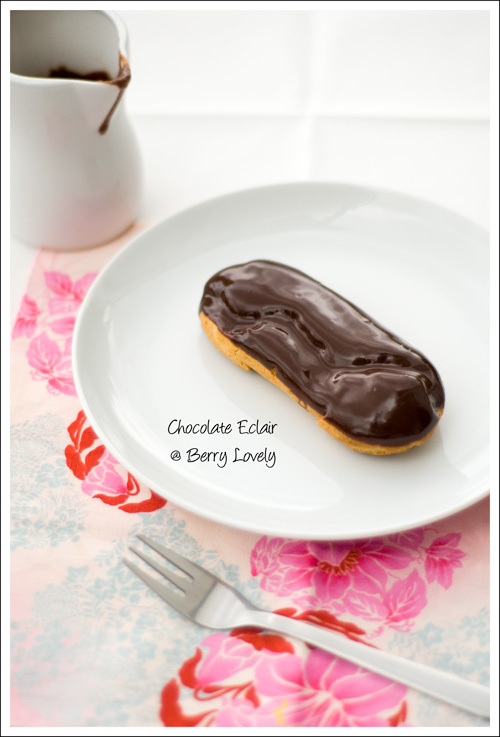 Using a small pastry tip, poke a small hole on each end into the bottom of each eclair shell. Fill the pastry cream into a pastry bag with a small round tip. Pipe the cream into each of the holes, until you feel they are filled. Dip the top side of each eclair into the warmed glaze, submerging it only enough to coat the top. Pull the eclair up and carefully shake off the excess. Let the glaze set in the fridge for a few minutes. Then take out and serve. They are best eaten fresh.